Our school uniform consists of the school crested tracksuit and white polo shirt. 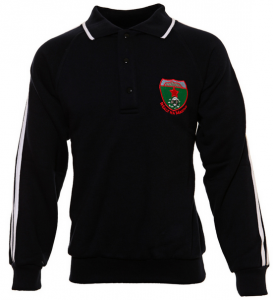 The school tracksuit can be ordered online from our uniform supplier HERE or by phone on 074-9732185. Navy trousers/skirt may also be worn with the school tracksuit top. In so far as is possible, shoes should be white or dark. See Positive Behaviour Policy for more detail. Check our Calendar for closures and holidays during the school year. The Board of Management (BOM) accepts no responsibility for pupils outside of these times. During Penal Times, it is thought that mass was said at a mass rock at the back of the present old church at Ransboro. Its location is on a high hillside with an extensive view to enable those on lookout to see priest-hunters while they were a long way off. Tradition has it that during mass a wren would come out of a crevice in the rock and remained near the altar until mass was finished. From that tradition came the name “Wrensborough” or “Wrensboro”, now known as Ransboro. There is no such townland in the area called “Ransboro”. 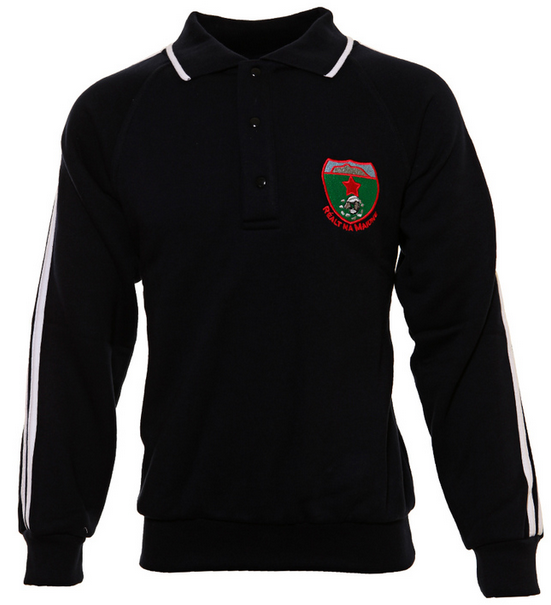 When the uniform tracksuit was being introduced to the school, a competition was held among the pupils to design the crest. The theme of the design was to be something of interest to the parish/locality. Paul Scanlon, a sixth class pupil at the time, won the competition. He drew a dolmen with Knocknarea in the background, both of which are of great historical interest in the area. 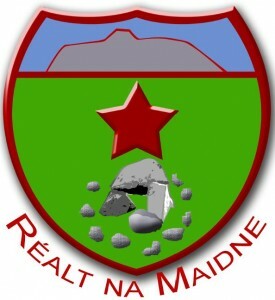 Underneath is the name of the school as Gaeilge “Réalt na Maidne” (school of the Morning Star). The crest now adorns the tracksuit worn by all of the pupils. The school follows the standard curriculum as set down by the Department of Education and Skills (DES). Subjects taught are Gaeilge, English, Mathematics, SESE (History, Geography, Science), SPHE (Social, Personal and Health Education), Arts (Visual Arts, Music, Drama), PE (Physical Education). As we are a school under Catholic patronage, the Alive-O Religious Education Programme is also taught. This programme is currently being revised with a view towards the implementation of the new “Grow in Love” programme. At the beginning of each school year, parents are asked to fill in a pupil profile form which contains contact details for parents. It is important that if this contact information changes for any reason, parents should inform the school as soon as possible. This contact information is used to make contact with individual parents if, for example, a pupil becomes ill at school. The school also runs a text-a-parent service and parents are informed of important school notices via this method of contact. One parent from each family can receive school messages via this text service. Parents are urged to ensure that the school has their latest mobile phone number to avail of this service.